This year; Trick 'O Treaters are treated to a mini Musical with puppets, Halloween song and dance, Dramatic Storytime, a Carving Pumpkin Demonstration, Magic Box Time, Trick O' Treat Bucket Craft Time (children to take home), and a smorgasbord of amazing activities including games, Trick O' Treating stations and more! Ready, Trick O' Treaters? Let's Party! For children ages 4+ to 8 years old. 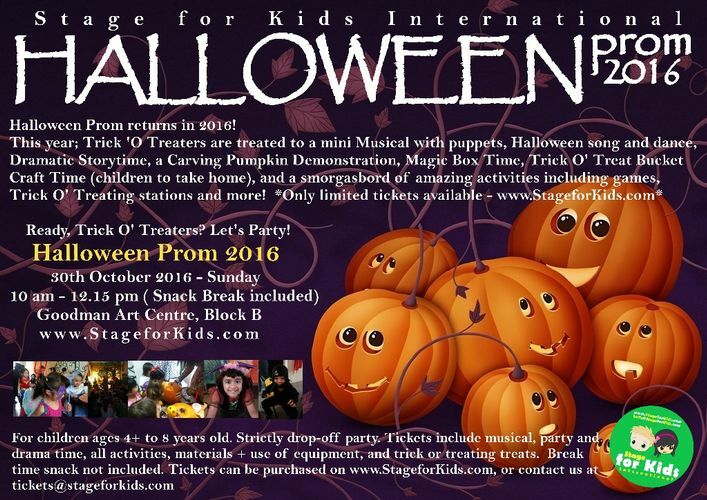 Tickets include musical, party and drama time, all activities, materials and use of equipment, and trick or treating treats.